Painted in the 1870s, this picture represents one of Lhermitte's favourite themes, one which he very often broached and which established his reputation. Born in a small village in Aisne -his main source of inspiration- Léon Lhermitte liked to represent his immediate environment, the countryside. After the 1848 revolution, many artists had turned to the study of man in his contemporary context, far from biblical, historical or mythological subjects, preferring the observation of daily activities. Courbet himself declared that he wanted to "convey the customs, the ideas, the aspects of my period." Lhermitte began to express himself as an artist at the time when all those to whom he was indebted for various elements of his talent were meeting with success: Millet, Breton, Daubigny and Corot are all particularly recognisable in this painting. From the former he borrows the peasant themes, from Daubigny his faithful vision of the countryside in its simplicity, from Corot, his sense of values. Once, in 1913, Lhermitte confirmed to his friend Fourcaud those interests which guided him throughout his life: "Nature always and everywhere provides artists with the subjects they need [...] One might never need to leave one's village." Although the subjects of his first works were very varied (indoor scenes, streets, markets, pilgrimages), his path was quickly traced. The artist dedicated his work to the description of rustic life, encouraged in his choice by the huge success in 1882 of The Payment of the Harvesters (Musée d'Orsay, Paris). 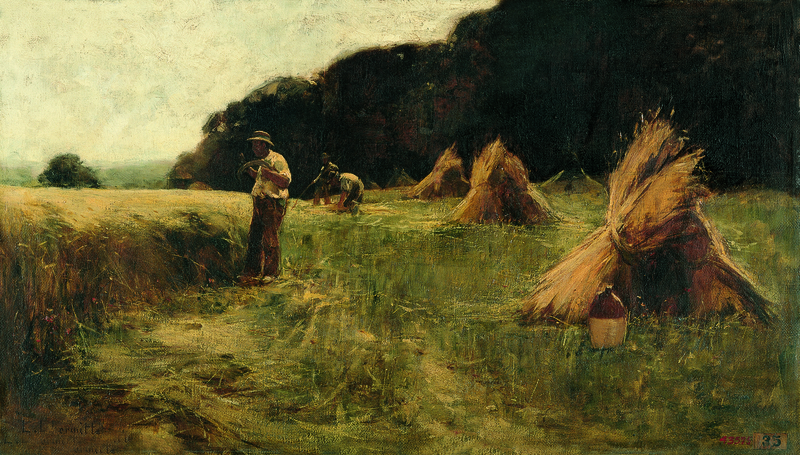 Here Lhermitte represented three men busy harvesting in a field near Mont-Saint-Père. The artist which the press much later nicknamed the "bard of wheat fields" can already be perceived in this composition. We can recognise his talent in evoking the undulation of the ears of corn, the gestures and proper attitudes of rural workers. In this painting, characteristic of his first period during which he drew more than he used brushes, Lhermitte painted what he saw, as the rightful descendant of Daubigny and of the painters of the Fontainebleau woods, whom he admired during his whole life and whose works he kept in his collection. He simply kept to the reality around him. He transcribed the scene objectively, without concern for anecdotes or additions of any kind, only representing the tools and accessories necessary for the harvest: the straw hat, the sickle, the whetstone and a pitcher to quench their thirst. Some years would have to pass before he began to depict his peasants as heroes, moving towards ideal beauty, thus transmitting a message about the dignity of labour and effort, or the beauty of the family. Then he attempted to raise his subjects to the status of historical painting, aspiring to the "grand manner" with paintings of a much larger format characteristic of the official style of the Third Republic and painted for the Salon, which ensured rewards, honour and glory. But it was not yet the case of this painting. Here, the characters are still part of the landscape, they are integrated in it. They are outlines, intent upon their tasks, unconcerned with the audience. They carry out their work, and Lhermitte painted them as he saw them in the fields, with no intention of representing moral views. 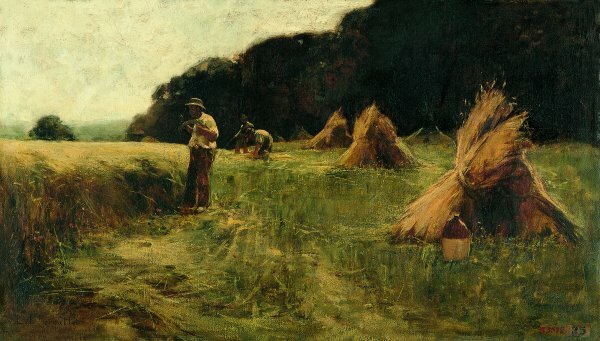 The artist did not yet depict them in the foreground, posing, life-size, individualised, with that extreme concern for detail he showed when he depicted Casimir Dehan, the famous harvester represented in 1883 in The Harvest (St. Louis, Washington University Gallery of Art). These harvesters are still a good example of the role and mission taken up by the artist and by the writer André Theuriet. The latter, in the introduction to his book La Vie Rustique published in 1887, declared: "We wanted to show both the peasant as we knew him -Lhermitte on the boards of the Marne, and I in the Meuse valleys- and to depict him with absolute sincerity, keeping us far from the sentimentalism of people who make up idylls, as well as from the brutal and false parti pris of the so called naturalist school [...] We tried to piously gather the relics of those traditions, physiognomies and landscapes which are bound to disappear."